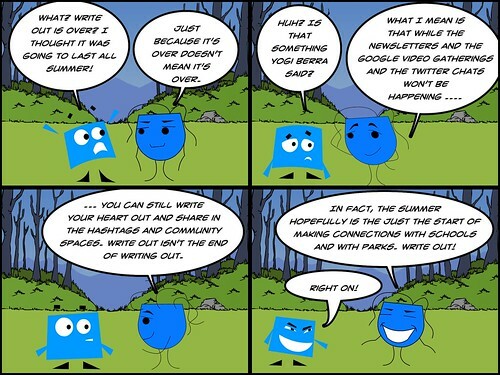 For all of July, we in the CLMOOC community were drawing and doodling and sharing. With today’s theme of “exit” now complete, I was trying to figure out how best to grab all of 31 of my doodles together. 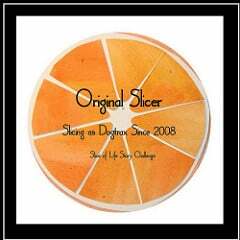 I’m still hoping to do a collage, but this video version via Animoto will have to do for now. The use of the artistic garden animation theme seemed … appropriate. Many of the crowd-sourced themes connected to the Write Out project, which is another open learning adventure that took place the last few weeks. I used the Paper app on my iPad for my doodles, and making art is always tricky for me. Writing is so much easier. Words flow faster than visual ideas. These pieces were all done with fingers, not stylus. Sort of like finger-painting. So, some of these doodles I made I like a lot and some, not so much. 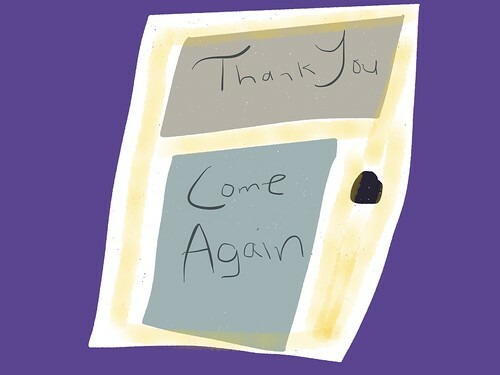 What I appreciated most was the call and invitation to doodle in a networked community, and to share with others, and to see how my friends took the same idea in different directions. We’re wrapping up the summer portion of Write Out, after two full weeks of activity and sharing an open learning network. You can read the last newsletter — which has suggestions for video reflections via Flipgrid and a LRNG Playlist to continue the work of making connections into the school year — and the hope is that teachers find park rangers, and park rangers find teachers. And that these partnerships help students find places beyond their schools and classrooms to become inspired to write about the world. As the band, Semisonic, reminds us: Every new beginning starts from some other beginning’s end. This is a bit of time-warp sharing, I guess. Although the two-week Write Out project formally is coming to a close this weekend, this writing camp project at our local National Park Service site — the Springfield Armory — happened just before Write Out started. But I finally got a video together to share out as we sorted out media permissions of students. 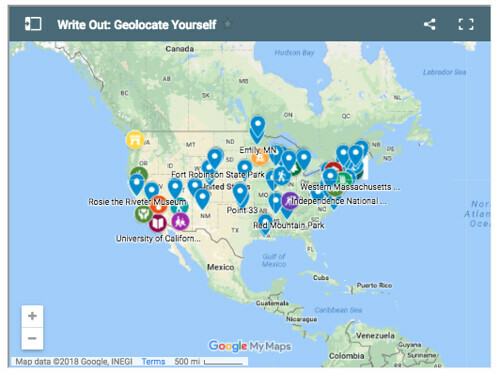 Write Out is a partnership from National Writing Project and the National Park Service to connect educators to park spaces for place-based writing activities. Our free summer camp — Minds Made for Stories — was aimed at middle school students from a social justice middle school in Springfield, Massachusetts. Funding for the camp came from Mass Humanities. Coordination of the camp involves the Western Massachusetts Writing Project, the Armory, the school system and the Veterans Education Project. A component of this project is a series of Professional Development sessions that I facilitated with the Springfield teachers, who then helped run the camp. We are planning more PD at the Armory for the Fall as well, thanks to a grant from the National Writing Project. We had nearly 20 students for a full week, at the Springfield Armory itself, exploring primary source material, using the museum itself as our “text,” welcoming visitors to the program to talk about women’s roles during WW2 and the Double V campaign for civil rights as well as a soldier’s life in the Civil War, and lots of different kinds of writing. The video captures some of the student explorations, and one of our final “publishing” events for the camp was the creation of a public display of student work that is now on the floor of the Springfield Armory museum, giving Armory visitors a look into some of the writing that students did this summer. All this to say, while a lot of Write Out work took place outside, and in beautiful forests and mountains and streams, there are also plenty of urban landscapes and history-rich buildings to explore, too. This is the third version of a poem I wrote for Write Out, using found sounds from the National Park Service sound site. The first version was a text poem, with links to sounds. The second version was a podcast, with my voice layered with the sounds. This final version is a digital poem, with image and sound and voice. What I have been trying to get at is how to best incorporate sound with a poem. While this version is the most visually pleasing, I admit that I sort of like the podcast — the version of just voice and sound — the best, for it forces you to imagine the animals and scenery. Here, I show you the image from the sound files. Which version do you like? I could not attend the second Twitter Chat for Write Out last night, so this morning, I spent some time digging into the questions and the responses as part of my curation after the fact. I loved the use of a haiku inspired by the work of others (that is so Writing Project, as Dave says in his tweet) and the sharing of explorations as well as the thinking around student writing and publication. It was nice to see some new folks in the mix and the conversation is another example of how networking builds connections. Which is a main goal of Write Out itself. But I didn’t feel satisfied with it in that version. It was text with links to the sounds. What I wanted to do was have the poems and the sounds together, as a podcast. So this second version — an audio poem — is all about sound — of my voice mixed with the landscape. I’ll be doing one more variation of the poem in the next day or two. 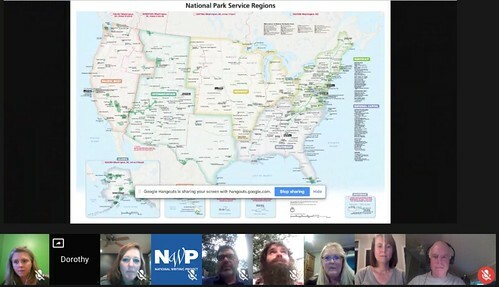 Last night, the Write Out project had its second Google Hangout, and it was a full house of educators and park rangers. Dorothy and Vicki did a masterful job of coordinating the large group of participants. I joined in the discussion, too, with my NPS partner and friend – Scott Gausen — from the Springfield Armory. We shared our summer camp for youths and the professional development we do for teachers at the Armory itself, as we explore themes of social justice and civic action with primary source materials at the historic site. Note: there’s a Twitter Chat tomorrow (Thurs) at the #writeout hashtag, starting at 7 p.m. EST. 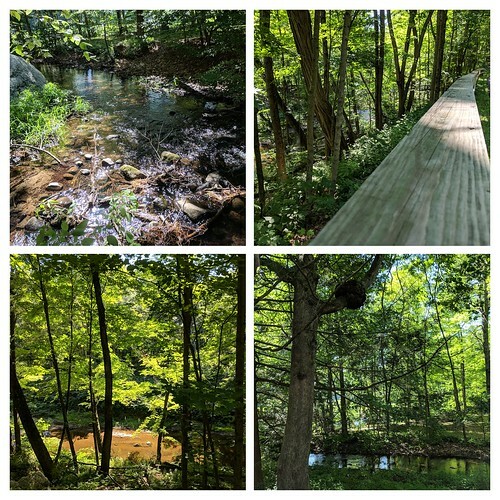 I’ve been part of the Write Out project, and although I have in the past spent quite some time at our local National Park Historic Site — the Springfield Armory — mostly the past week, I have been wandering our local neighborhood on foot to pay closer attention to nature. Yesterday, I started a walk before the summer rains returned. In the early morning, it was downpours for long stretches of time, following on the heels of rain the day before. I wanted to see the river, and boy, was it flowing! I had wanted to get a few more pictures, but the rains drove me home. 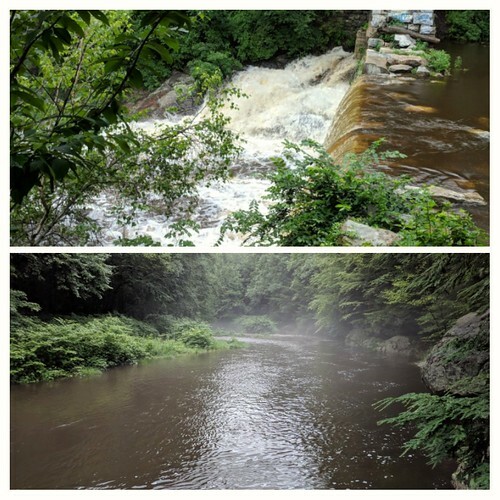 Recently, I wandered on foot to the nearby city-protected watershed area. 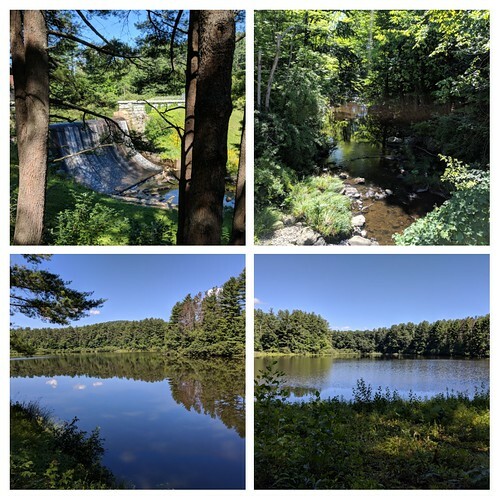 It’s a beautiful place, and I startled a Blue Heron on my walk and then watched it float effortlessly and seemingly with patience right over the reservoir. I didn’t get the heron on camera because I didn’t want to interrupt the moment. Finally, the nearby bike path is also a protected Greenway Space, so I spent time along there the past few days, too, poking my way off the foot trails. What have you been seeing in your world? Learn more about Write Out, a partnership between the National Writing Project and the National Park Service. We’re entering the second week of Write Out, where the themes do a natural shift from “mapping possibilities” to “mapping connections” as we urge educators and park rangers to make plans and efforts to connect with each other. We have nearly 85 pins on our GeoLocation Map (which has been viewed now more than 1,300 times) and this week’s newsletter is now out with all sorts of invitations for you to think about. While the hope is that teachers will write with rangers, the larger aim is to make connections so that students will also have those opportunities. As with the first week, we have broken down possibilities based on time you have available, so whether you only have a little bit of time (you might Wander) or a significant amount of time (you might Camp Out), there are possibilities for you to consider. See you on the trails! (Live events include a Connect with Me Google Hangout session on Tuesday night at 7 p.m. est and a Twitter Chat on Thursday at 7 p.m. est).